For consumers who have consistent excellent credit scores, experts warn that ignoring regular reviews of credit reports can spell trouble. 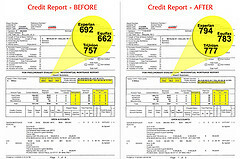 Credit reports account for all of the credit activity going on in a consumer’s financial life. It may also be the first indicator that something is wrong and further investigation is necessary in regard to financial criminal activity. Identity and credit card theft is still on the rise and if consumers forgo checking into their own credit reports, they may be missing red flags that someone has hacked their identity. Because technology has afforded may more ways for criminals to secure credit card and other personal information, it is imperative for consumers to keep checking in with their own credit report. The law entitles consumers to receive a free copy of their consumer credit report from the major consumer credit reporting bureaus. Credit scores cost an additional fee. Consumers are encouraged to order the free copy once a year and review the information for accuracy and evidence of scams. Accounts that appear on a credit report which have not been authorized by the consumer need to be reported at once. Without reviewing credit reports regularly, consumers are at risk for being victims of identity and credit crimes. Even with excellent credit scores, significant score drops can occur with criminal activity, leaving a consumer caught up in the red tape of regaining their identity which can take years and bring about much financial difficulties in the long-term. They will also need to rebuild their own credit in order to get back to a good status. As the economy continues to struggle, there is an increase in financial related crimes against innocent people. A consumer has an obligation to review their own personal financial information on a regular basis and report incidents of fraud and other criminal activity.